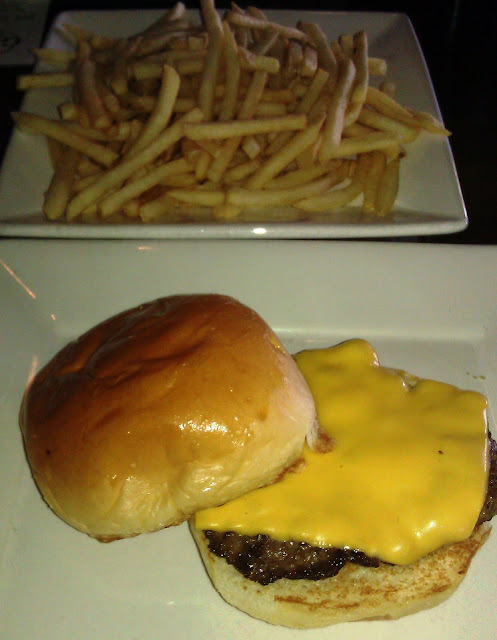 Day two of our Spring Break burger tour in Las Vegas took Happy Meal and me to Grind Burger Bar & Lounge. Grind was a located in a strip mall, so parking was very convenient. Casino parking sometimes involves a lot of hunting and walking. It was a funny coincidence that the hostess at Grind also worked at Hash House A Go Go, where we had bumped into her the day before. Aside from burgers, Grind served up pizza, a variety of inventive appetizers, and some salads. Chef Miguel had us sample the Thai Calamari, and it was a wonderful dish that combined sweet, sour, savory, and just a little bitter from the deep-fried lemon chips. 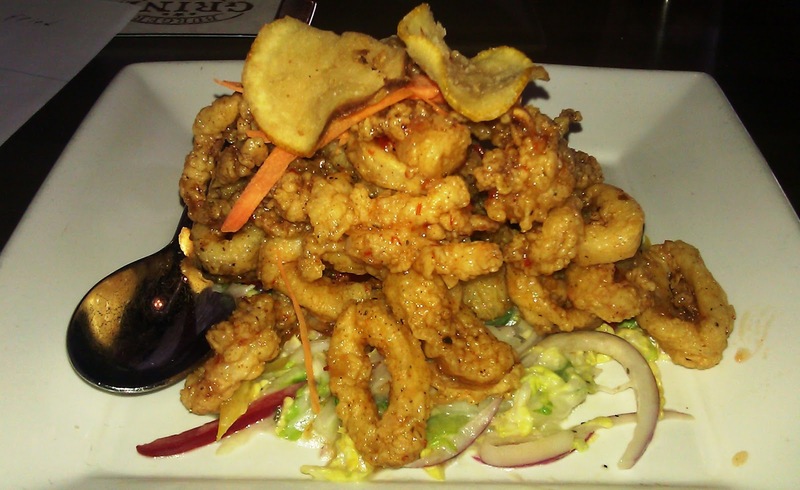 I would return for the calamari and a turkey burger--more on that to come. We toured the kitchen, and it should be noted that if you fall catastrophically ill, do so at Grind Burger Bar & Lounge--emergency surgery could be safely performed in the kitchen with no advance notice and no risk of infection. The busy kitchen was immaculate. I checked hidden surfaces like door seals, behind handles, and the bottoms of shelves, and I couldn't locate any unclean spots. The floors were spotless. Clearly the restaurant mantra, "If you've got time to lean, you've got time to clean." was honored here. The flat top was gleaming without a trace of carbonized oil on the cooking surface. I explained to Happy Meal that this was the new standard for his room, which was in shocking disarray as always. 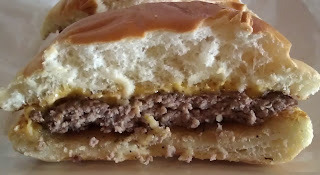 We discovered that the top selling burger was the towering Juicy Lucy. Before the staff was told to advise patrons to proceed with caution, Grind racked up quite a few cleaning bills after eager patrons pressed down too quickly on their burgers. The burgers were moist enough to squirt juices onto their clothing. We ordered a couple of single patty, 4-ounce cheeseburgers fro $7.49 each from the build your own menu, and we settled in for a brief wait. The Beef: The beef at Grind was source from Fulton Provision Company. The 25% fat Chuck was beefy, funky, and juicy. The grind was medium coarse. The bite was firm but not chewy. The beef was brought to Well-Done, but it was not an aggressive, joy killing Well Done. As a result, the beefiness from the fully denatured collagen really blossomed and the burger arrive hot and juicy. This wasn't house-ground, dry-aged Sirloin, but it was really quite good. The burger meat was terrific at Grind. The Seasoning: Sea salt and pepper were applied in just the right amounts to maximize the impact of the strong beef flavors. Also, a small amount of Turbinado sugar was applied. The Sear: The Turbinado sugar caramelized, and this couple with the browning of the burger's amino acids from the Malliard reaction to present a really nice sear. That spotless flat top wans't just for show. This was all about efficient and even heat transfer, control, and the ability to reduce any variations in flavor. 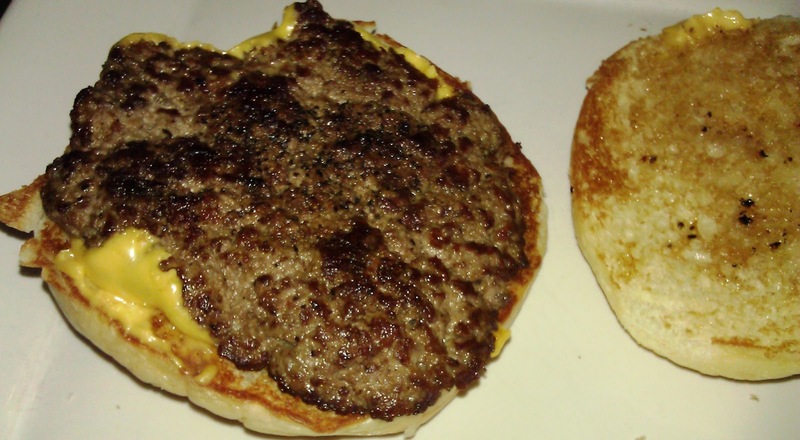 The clean surface imparted as good a sear as one could get onto a 4-ounce patty. The Preparation: The freezers contained no beef--only the refrigerators. I assumed from that, and the texture of the beef, that Grind Burger Bar & Lounge used only fresh (never frozen) beef. 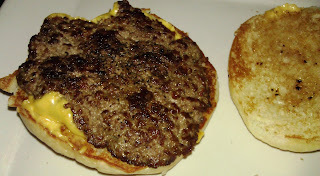 The burger patties were formed during morning prep. About 120 4-ounce patties and 100 7-ounce patties were created by a skilled and gentle hand. The Cheese: Of the 6 cheese choices, we went with American and happily so. 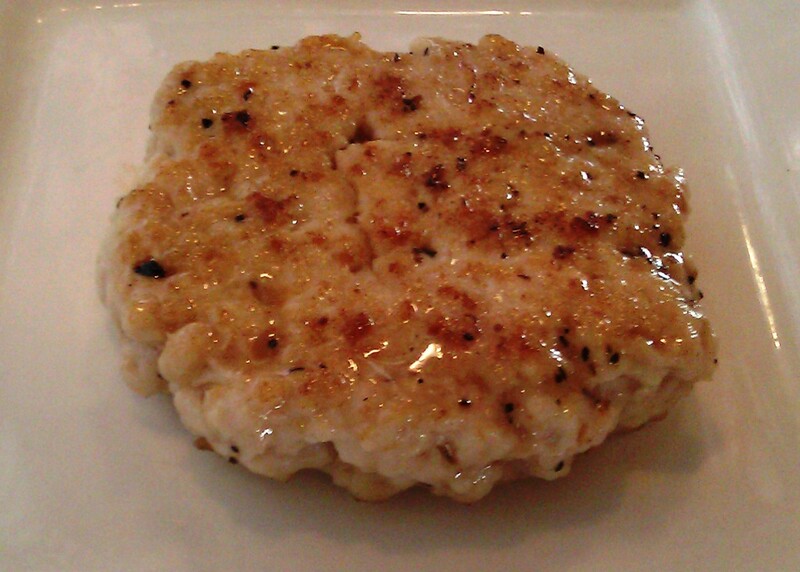 The melted American cheese combined with the savory seasonings and served to perfectly balance out the sweet bun. The Bun: The bun at Grind was the same bun used at Bachi Burger, only the burgers at Grind were not celebrations of mediocrity. Don't blame the bun. The soft, sweet, moist, yeasty buns came from the same bakery in Las Vegas. I don't recall the name, but the bun is very similar to what a Chinese BBQ pork sandwich would arrive on. Sweet on the outside--pillowy and yeasty on the inside. The Meat to Bun Ratio: This was just right. The Toppings: The shredded Iceberg lettuce was fresh as was the tomato slice. The Fries.The $3.00 order was large enough to share. The fries were previously frozen, par-cooked, and shoestring. The were nicely crisped in fresh canola oil. The fries were perfectly seasoned. The Value: $10 for a really solid burger and fries. The prices were perfectly fair. Other Notable Menu Items: The veggie patty at Grind Burger Bar & Lounge was a chick pea patty. This was ground garbanzo beans blended with cumin, turmeric, lemon, and parsley. It was then fried and griddled. the result was a better version of falafel. The turkey patty was the thing that I wanted to return for. This was a juicy patty of chopped turkey breast. It was seared with cayenne flakes, sea salt, pepper, and a little Turbinado sugar. The turkey patty was spectacular, and putting cheese on that would have been a crime. Grind Burger Bar & Lounge had to be better...it was not located on the strip or in a casino, so it could not have survived on tourist churn. This establishment just served up great burgers and earned a loyal, local following. 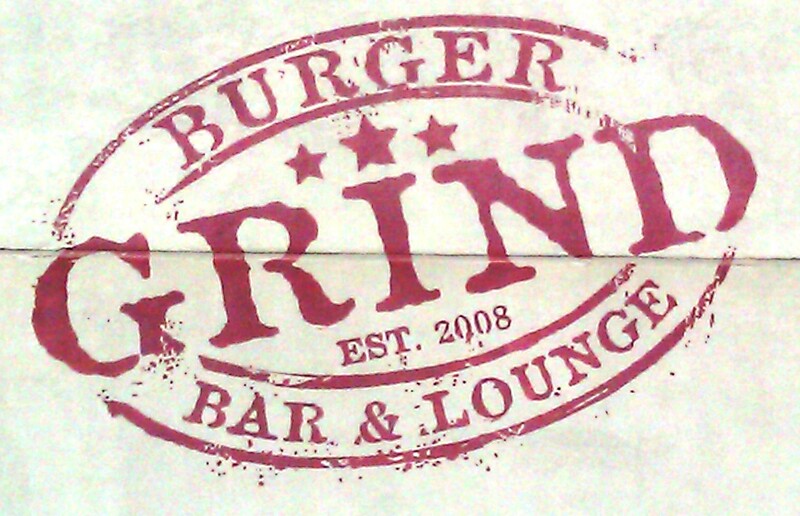 Burger Review : There are no bad choices at Grind Burger Bar & Lounge. The burgers are cooked with great care and it shows.